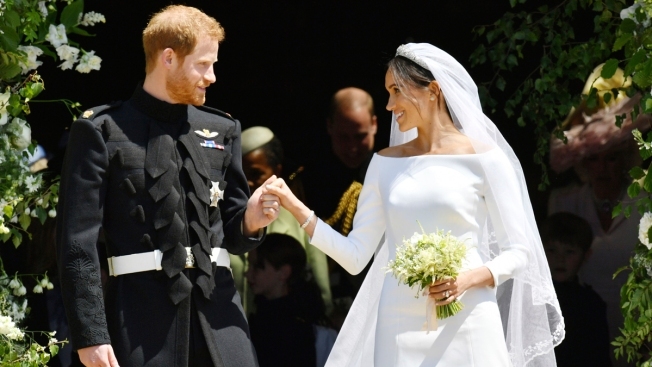 In this May 19, 2018, file photo, Prince Harry and Meghan Markle stand on the steps of St. George's Chapel in Windsor Castle in Windsor, near London, England, as they leave after their wedding ceremony. The father of the former Meghan Markle says he talked politics with Prince Harry over the phone — and Harry argued that he should give President Donald Trump a chance. Markle said Trump was discussed at least once: "Our conversation was I was complaining about not liking Donald Trump, he said 'give Donald Trump a chance.' I sort of disagreed with that."